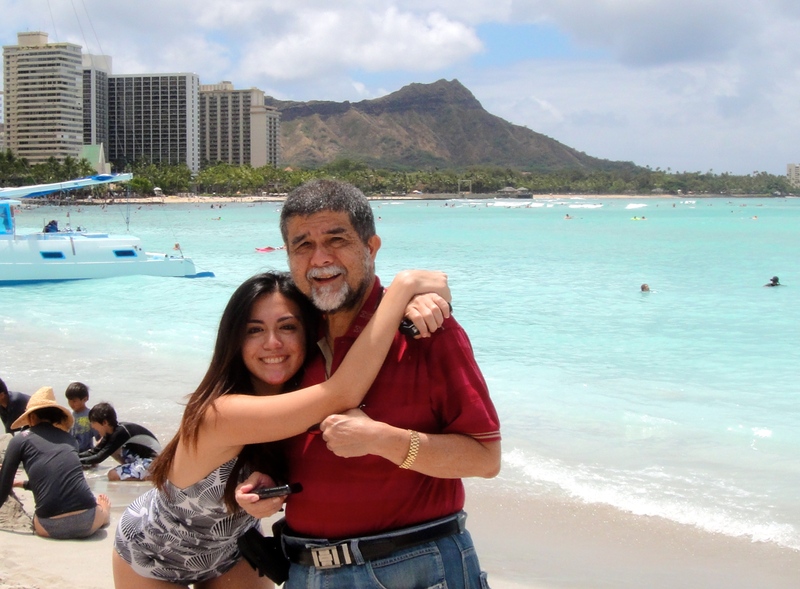 This trip was particularly special to me for numerous reasons; it was my first time to visit Hawaii; it was my first time to get a trip incentive from work and it was my last trip with my father. I’ve often so heard from colleagues about how enjoyable their conventions are and I just die with envy but now there I was, experiencing it for the first time, not just a tag-along with my dad but as a first time qualifier, I couldn’t have been more excited. What can I say but it was sincerely one of the greatest trips I’ve had and I couldn’t stress that out more. 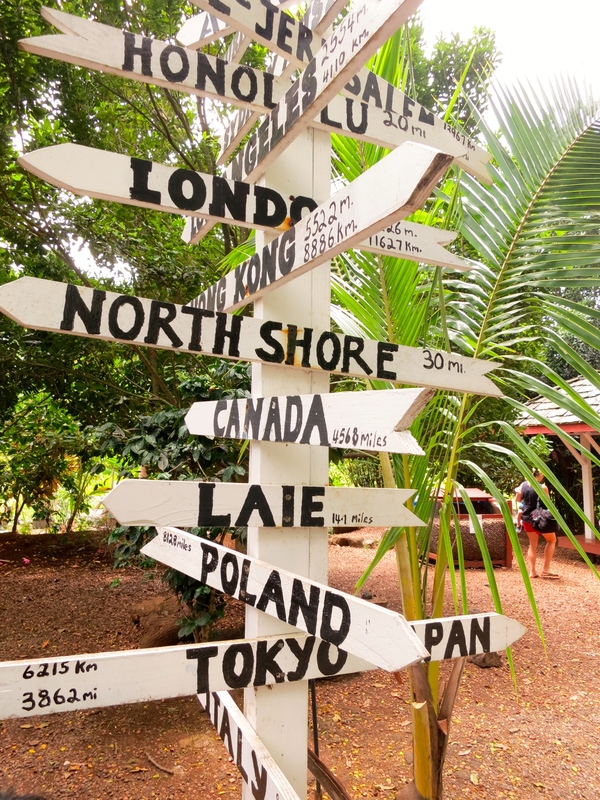 Every time I travel, it’s always on a budget, I have to list all the expenses and keep track of my money but this time, it was lavishness to its core! Of course who wouldn’t want VIP treatment all the way and did I mention everything was free? For the first time I didn’t have to plan the trip on my own and I didn’t have to worry about anything aside from waking up at 6am and my belly being stuffed for the next 5 days. 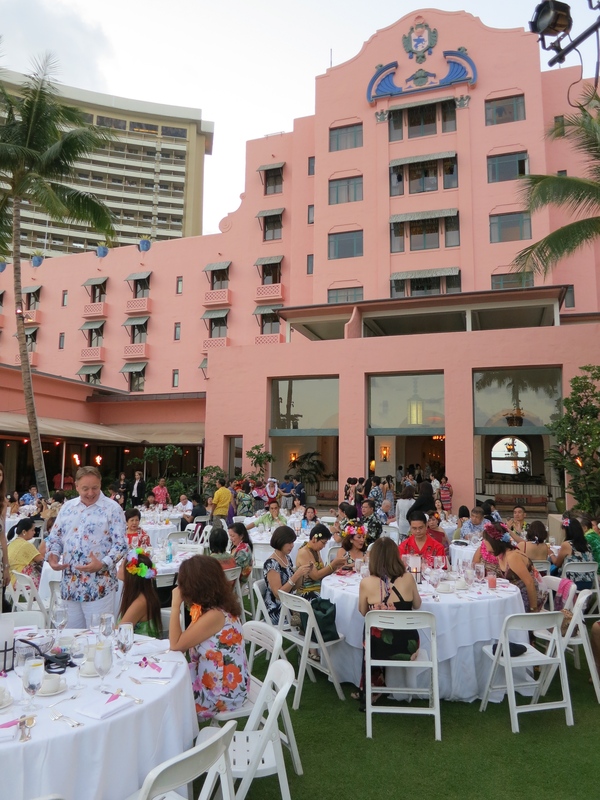 We stayed at the iconic Royal Hawaiian Resort, commonly known as the “Pink Palace of the Pacific”. This hotel was built in 1927! I love the architecture and the old-school vibe interiors this hotel has. 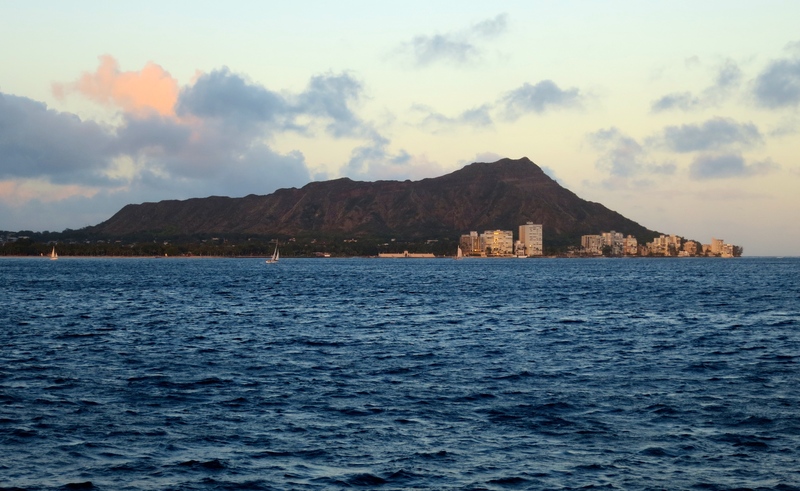 Location-wise, it was perfect – a few steps from the shopping district and a few steps to the famous broad white-sand beach of Waikiki – not to mention the perfect view of Hawaii’s landmark, the Diamond Head is visible at the balcony. What a dream come true it was! I’m not very fund of being in a bus all-day and traveling on a tight schedule but I didn’t mind this one at all. It’s different if you’re in a bus full of people that you know. Full of fun people! 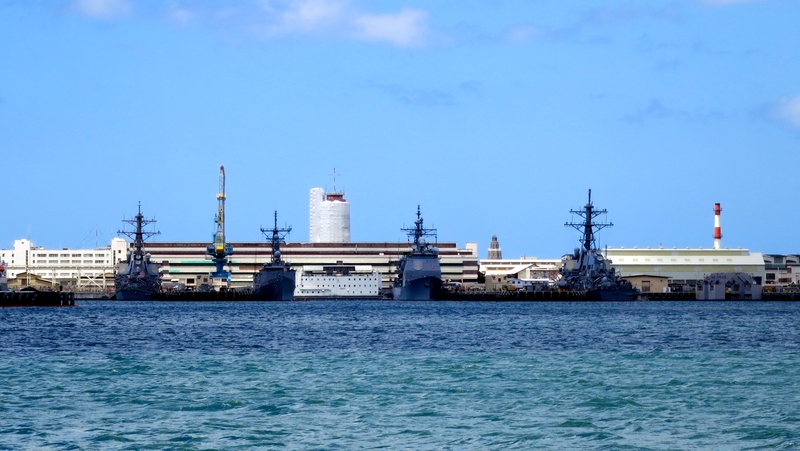 Our second day was all about touring Oahu in a different less known area. First stop was this nut farm. 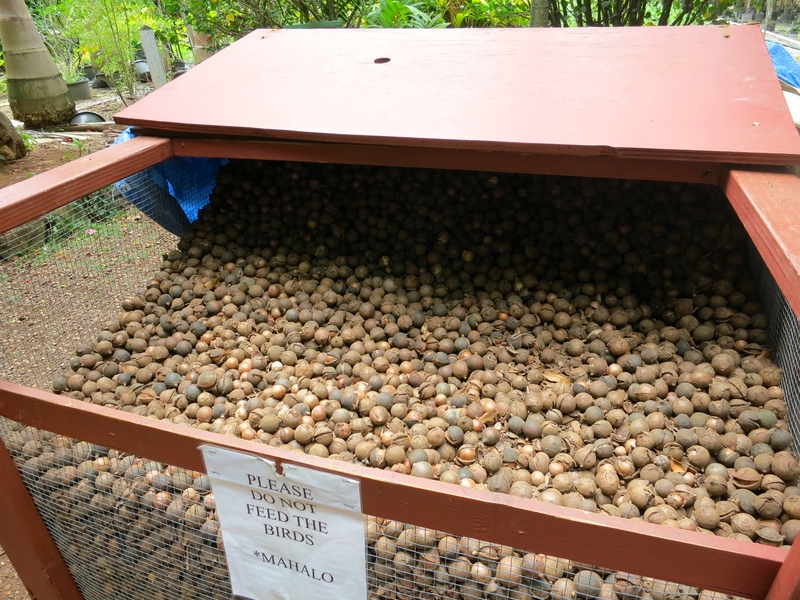 This place reminded me of the BEE FARM in Bohol, Philippines, only this was a macadamia nut farm. 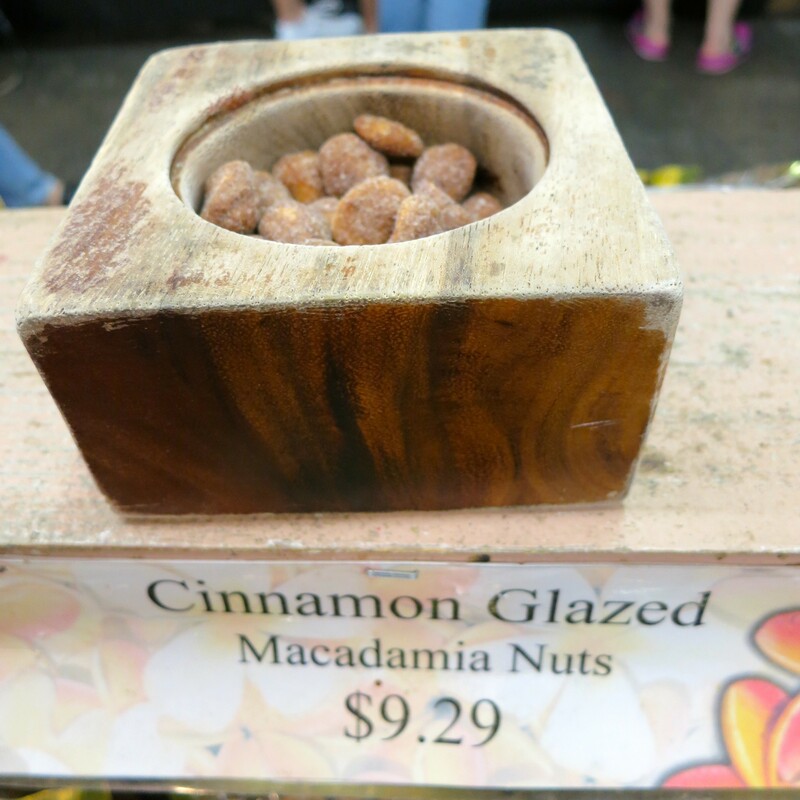 It’s a great place to buy souvenirs since macadamia is their specialty. Everything visible and edible was made out of macadamia from the coffee to the sauces and just about anything. Seeing as we were on a tour, of course we had no choice but to see what this place had to offer; some would say it was a “Tourist Trap” because of the tourist prices which I think was true but nevertheless, I still enjoyed the very cute place. 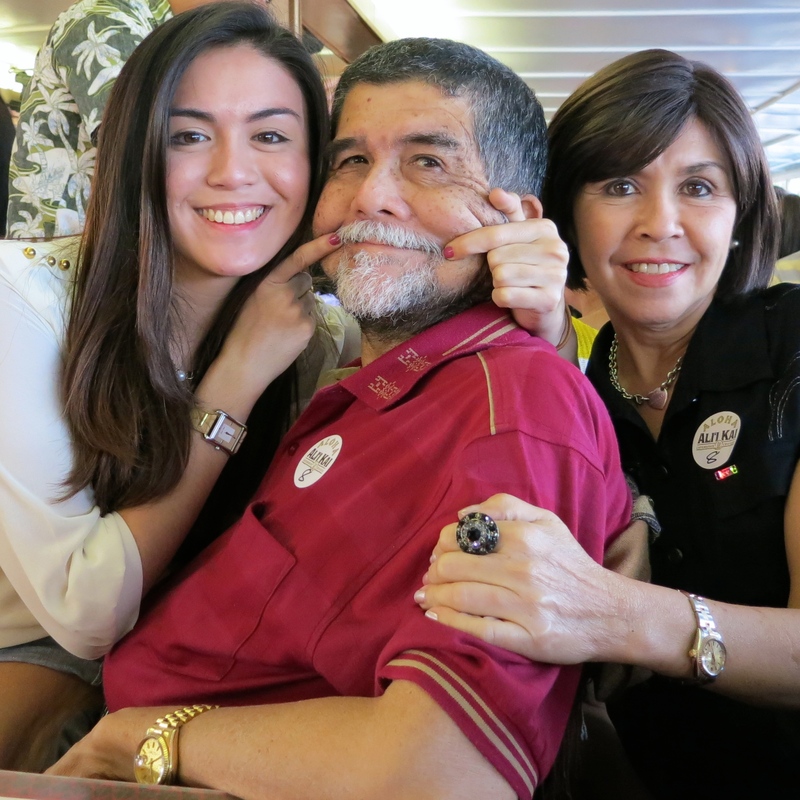 My dad loved nuts so he had so much fun munching on the freebies with my mom. 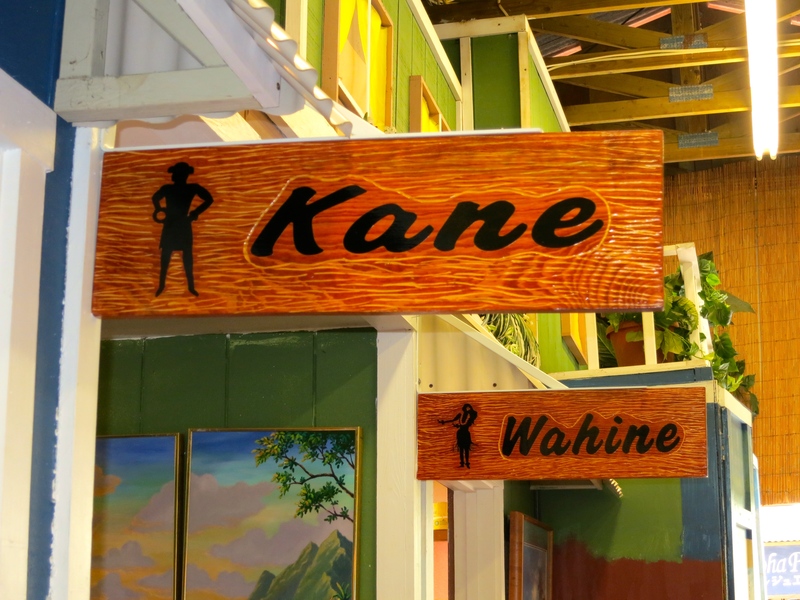 Next stop was what I called the “Universal Studios” of Hawaii named Kualoa Ranch. I admire the owners of the ranch (yes! It’s privately owned), they have preserved this precious chunk of land from all commercial developments and they intend to keep it that way. 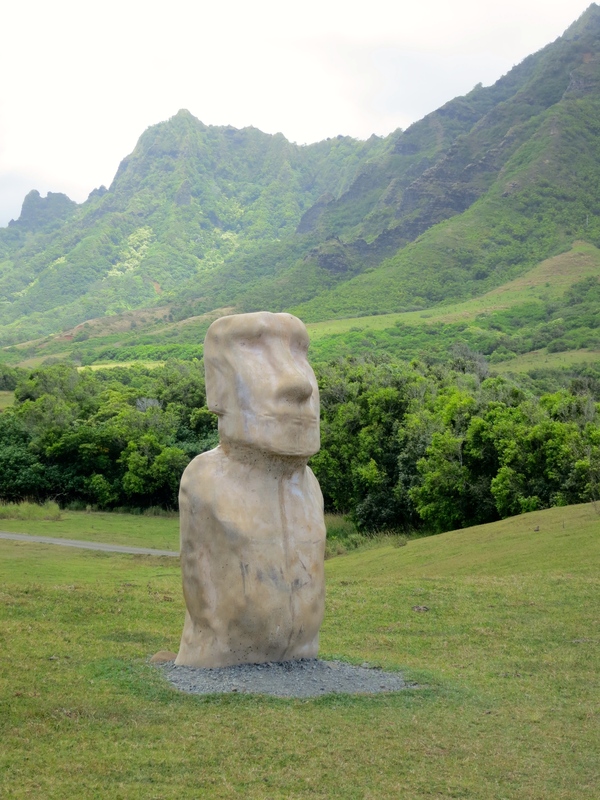 The land is so untouched and is very well maintained that it has become a famous setting for Hollywood Movies. 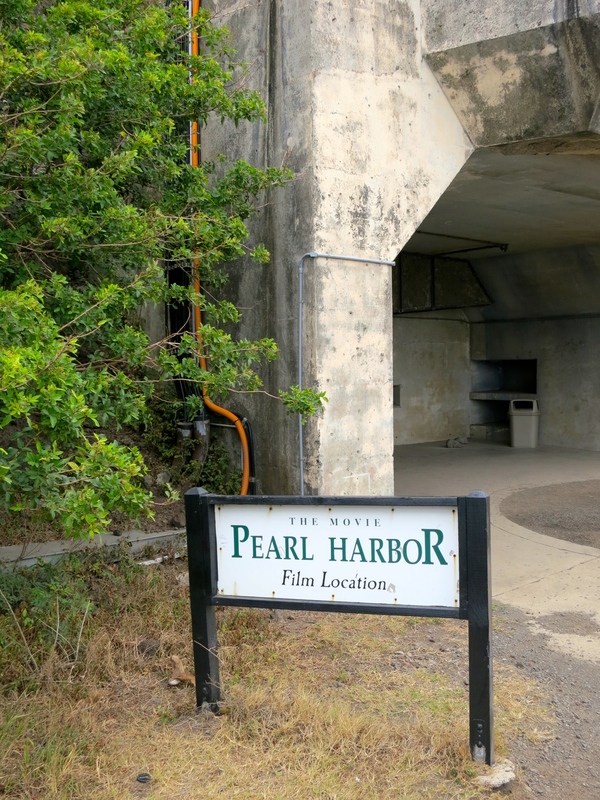 We hopped on a vintage, open-air bus and made our way to the different sets of our favorite Hollywood movies; Godzilla, Pearl Harbour, 50 First Dates,TV series Lost, Mighty Joe Young and Jurassic Park to name quite a few. This beautiful view can be seen from the ranch. 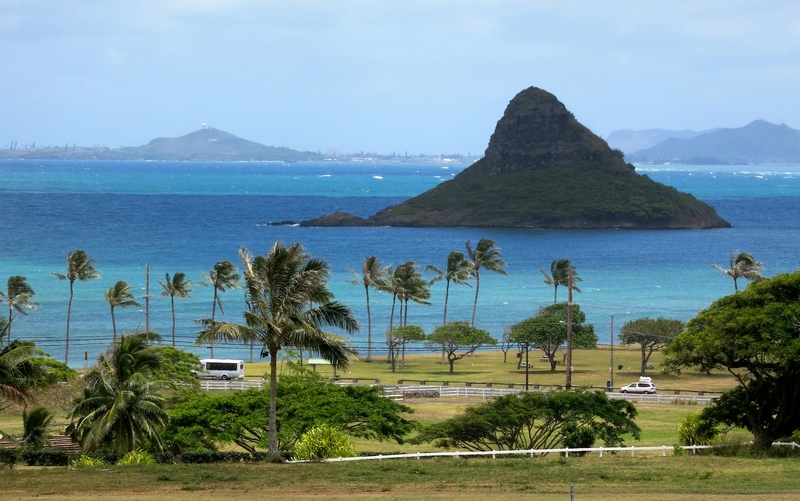 The island is called “The Chinese Man’s Hat”. The tour was so much fun! Especially with our very humorous tour guide. After almost 2 hours of touring the ranch, I couldn’t wait to eat. We had a picnic lunch with everyone in the ranch with an amazing view. After an entire day in the bus and seeing so much film sets, it was now time to relax and have a wonderful dinner in a boat. 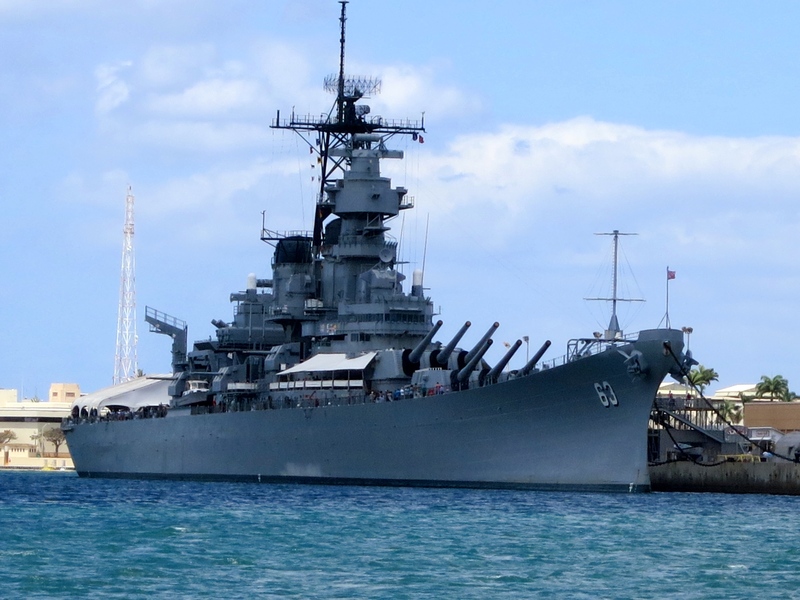 My ultimate favorite movie of all time is Pearl Harbor; it was what got me fascinated in learning all the events that transpired during the WWII; so when I found out one of our tours included Pearl Harbor, I couldn’t hide my excitement! 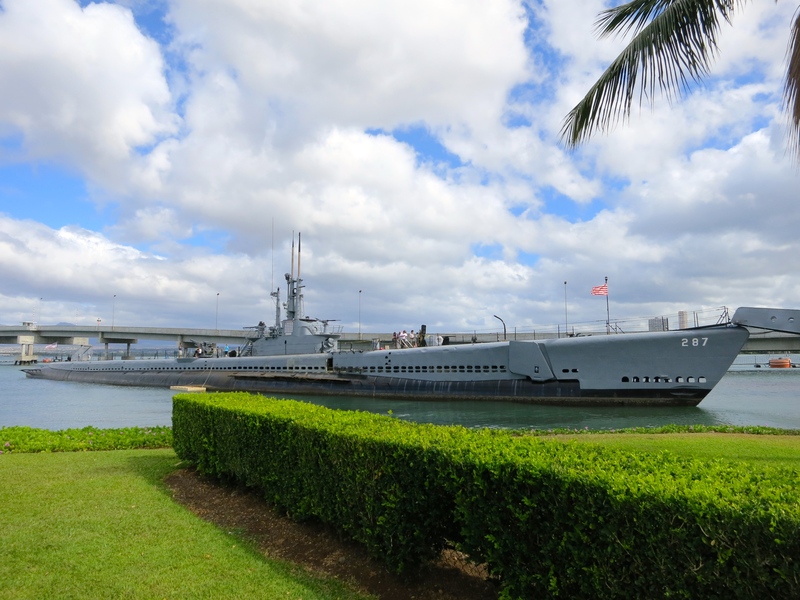 I tried to imagine myself going back in time to December 7, 1941, the date that have lived in infamy and it was just too overwhelming. 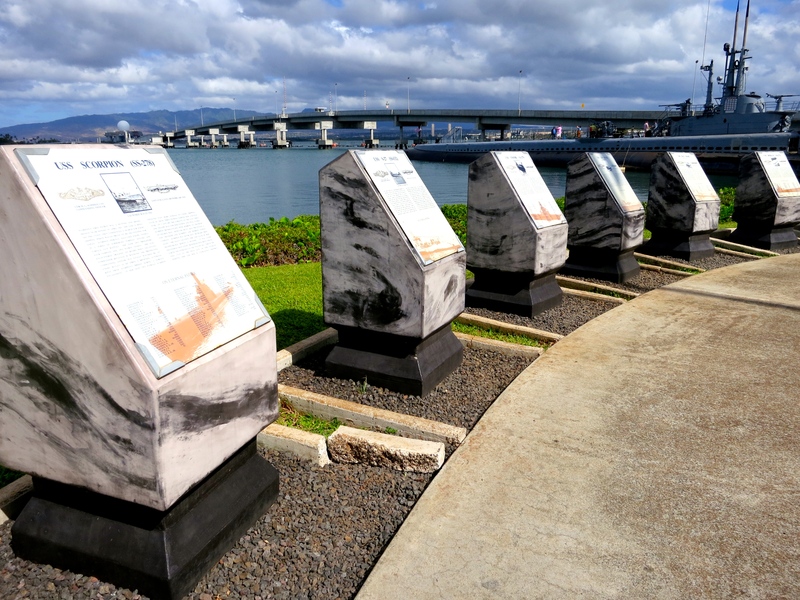 It was so surreal to be there, standing before the waters of Pearl Harbor where so many innocent lives were taken, there were simply no words but my emotions were going wild. 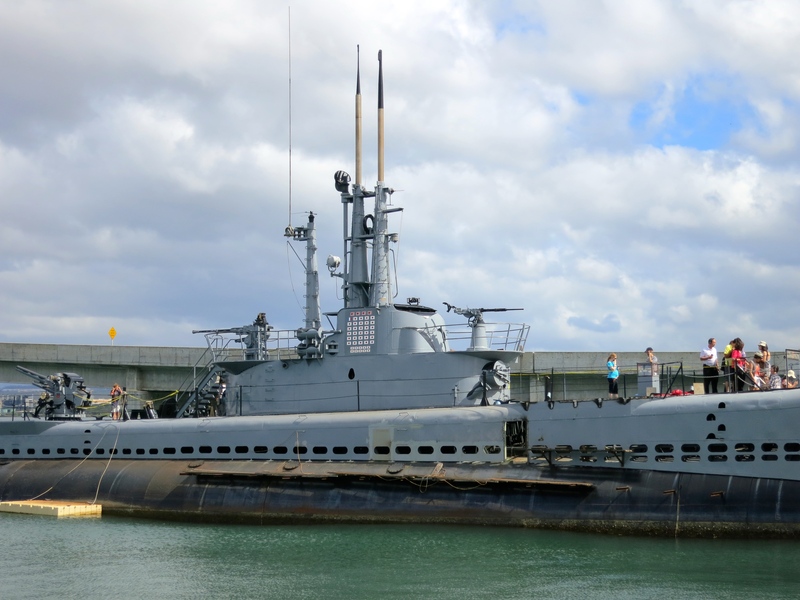 All around Pearl Harbor, you see the different weapons, navy ships and submarines, the few living survivors of the war. 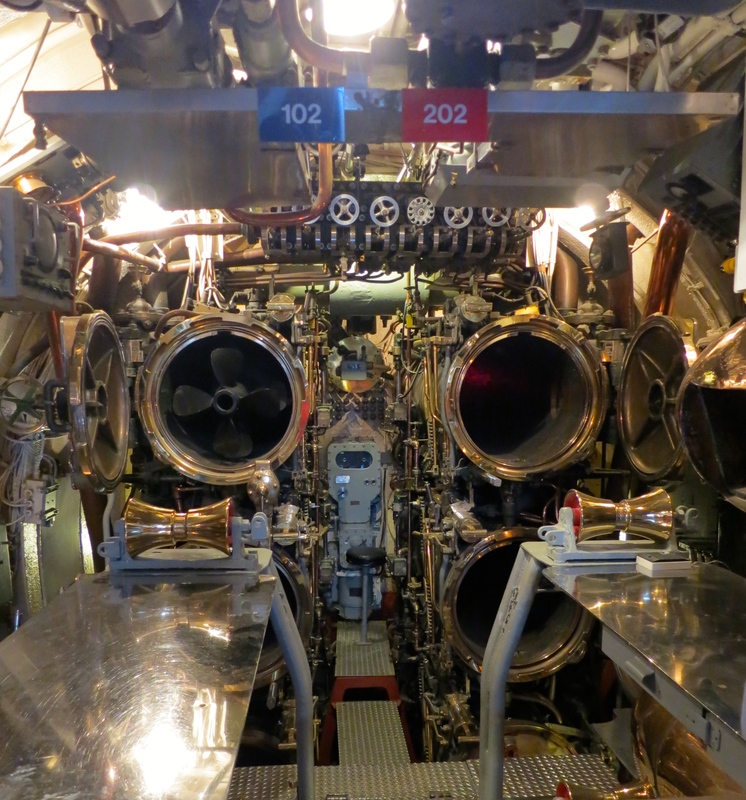 I had the chance to go inside USS Bowfin, a submarine that they opened for the public. 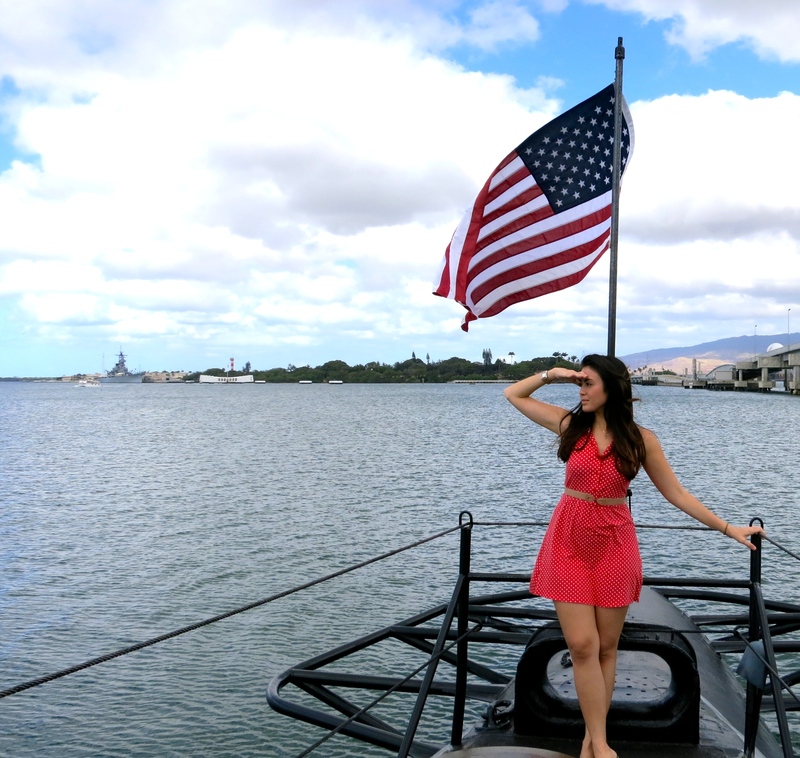 Part of the tour was riding on a boat that would take you to a memorial built exactly above the USS Arizona ship. 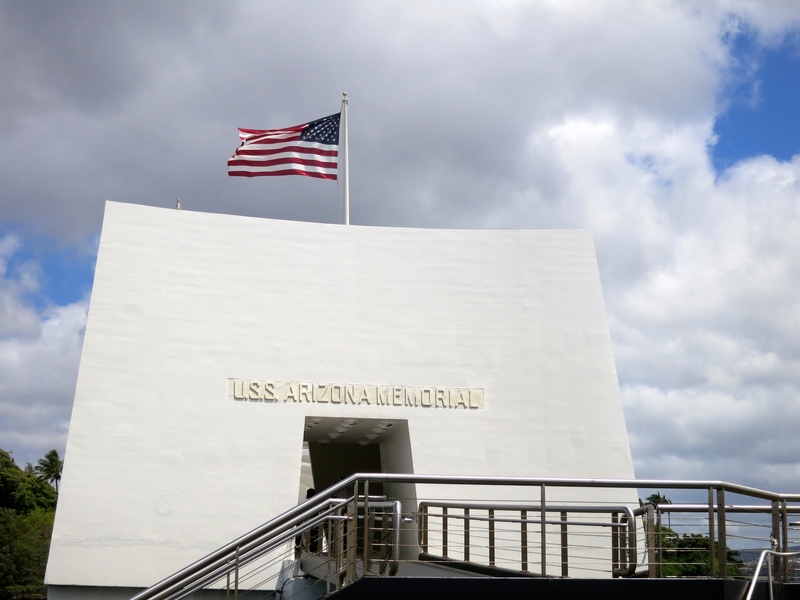 This memorial is made as a tribute and as a resting place of the 1,102 sailors and marines who were killed and are still inside the USS Arizona. 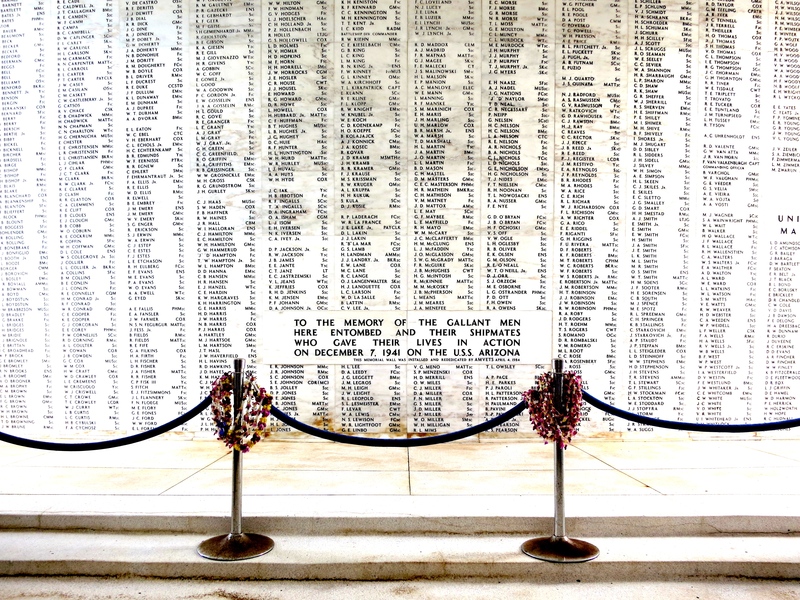 Their names have been embedded on the wall of the memorial to remember the brave men that they were. 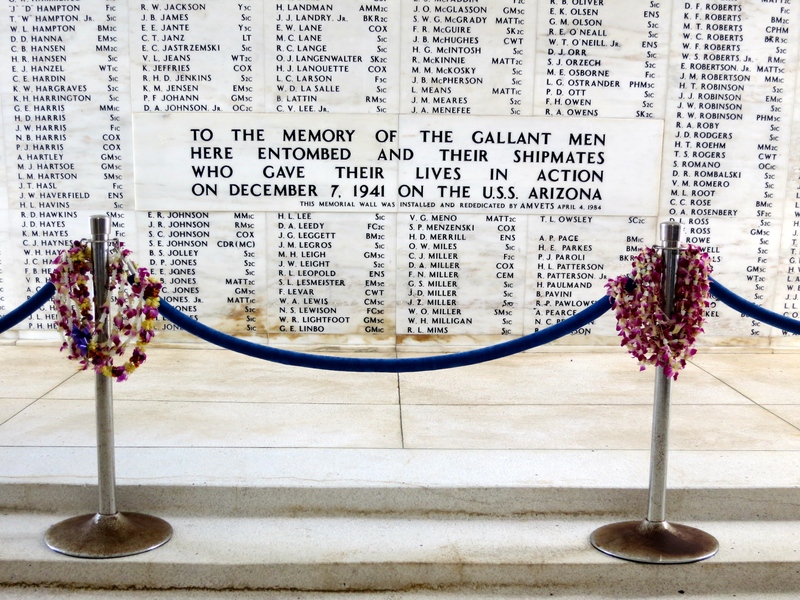 Even the survivors, when the die, want to be laid to rest at this memorial to join their fellow heroic men. 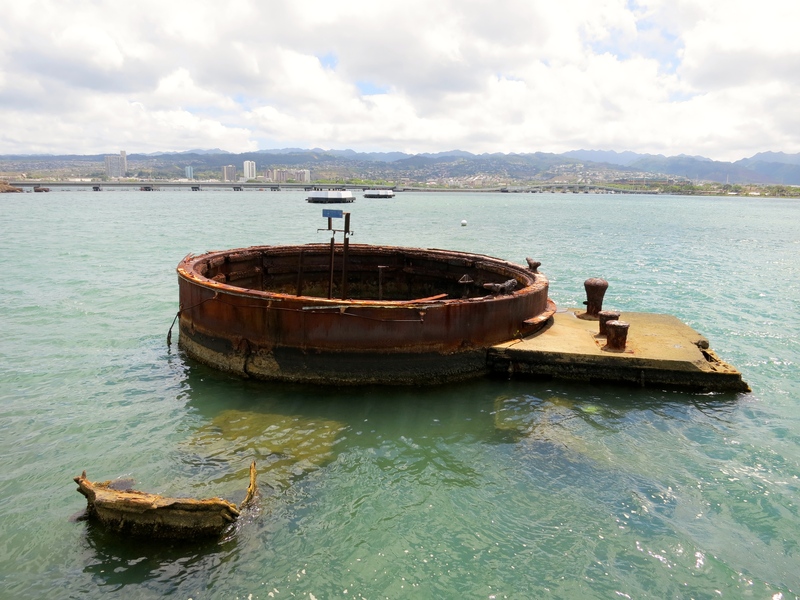 71 years after the attack, you can still see oil coming out from the USS Arizona, reminding us all of the infamy that was December 7, 1941. 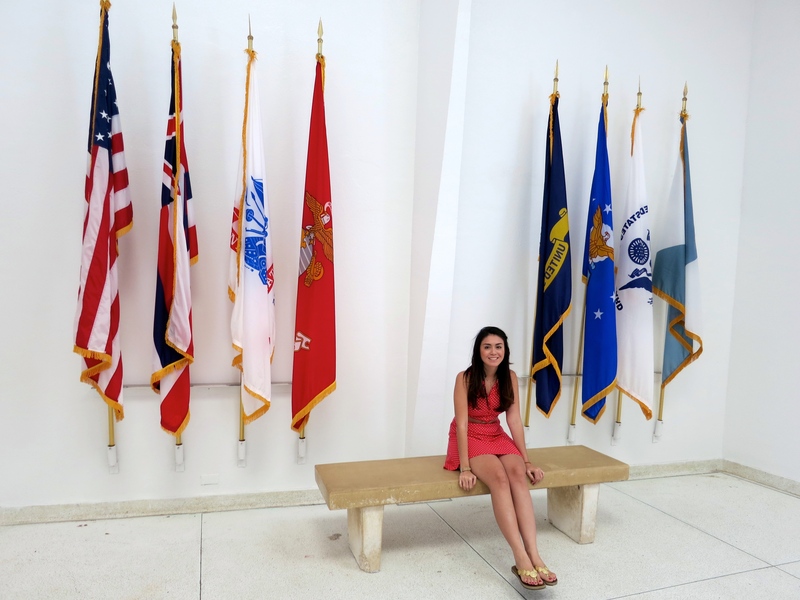 I was so overwhelmed to have met Everett Hyland, a survivor of the Pearl Harbor attack. He stays here to tell his story to those who want to listen and he gives out pamphlets and signs autographs too. Ironic isn’t it? After the emotional Pearl Harbor Tour, they bring us to this famous JAPANESE buffet that was really close to the memorial. After all the tours, shopping and fun-filled activities we’ve had for the last 3 days, we now had to say goodbye to everyone as we go about our separate ways. 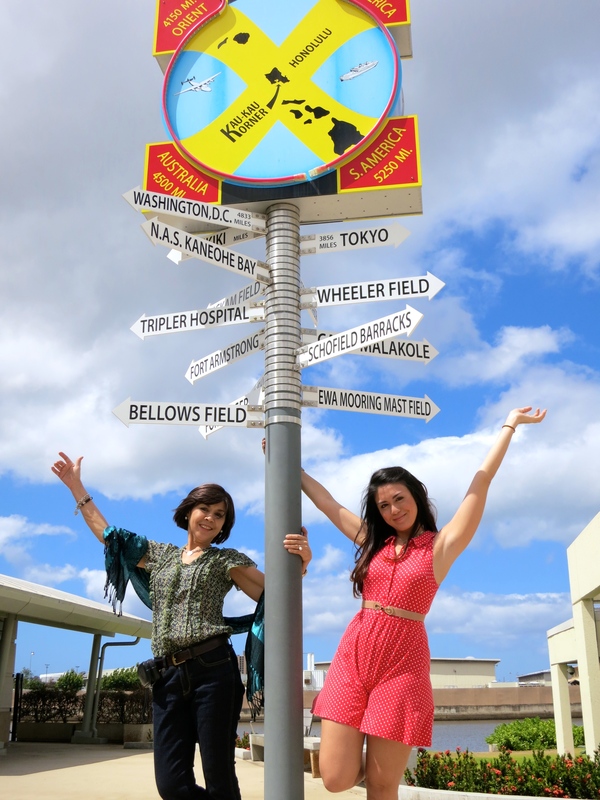 How better to say Aloha to everyone? 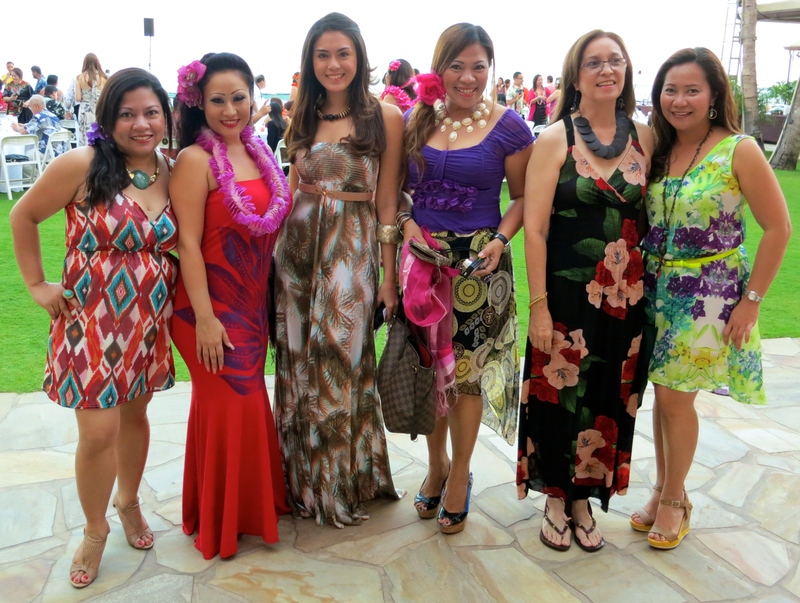 Have a Luau, ofcourse! 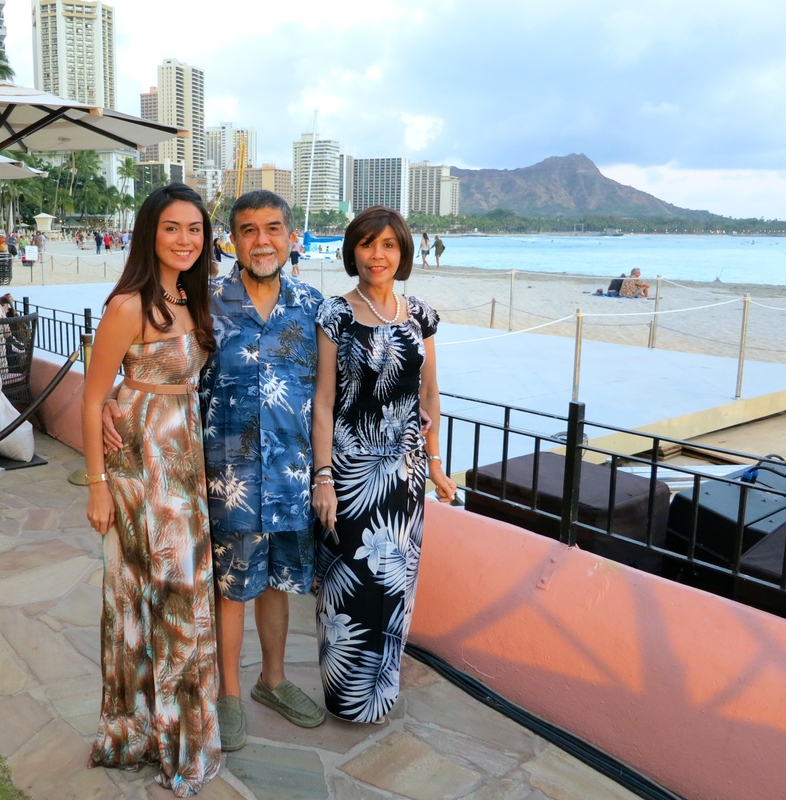 All of us were in our best Hawaiian attires for our last night in Hawaii. The Mai Tai bar at the Pink Hotel was the perfect place for this; we had amazing food; I was with best company; we were very entertained with the Hawaiian dancers; and what more can I ask for? I was with my parents. Lets just say I had a little bit too much fun at the Luau last night that I couldn’t even do anything on our last day. All I wanted was to be at the beach to cure my headache and come to think about it, this was probably the only time I had spent on the beach. 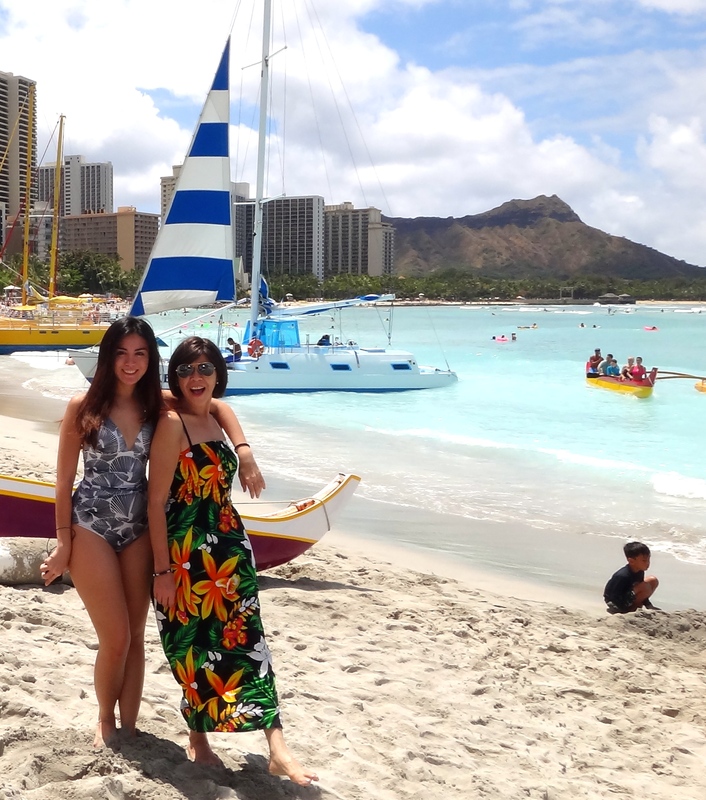 Being under the sun all morning and feeling the salt water touch my skin in the bluest of the blue waters of Waikiki Beach was the best remedy. 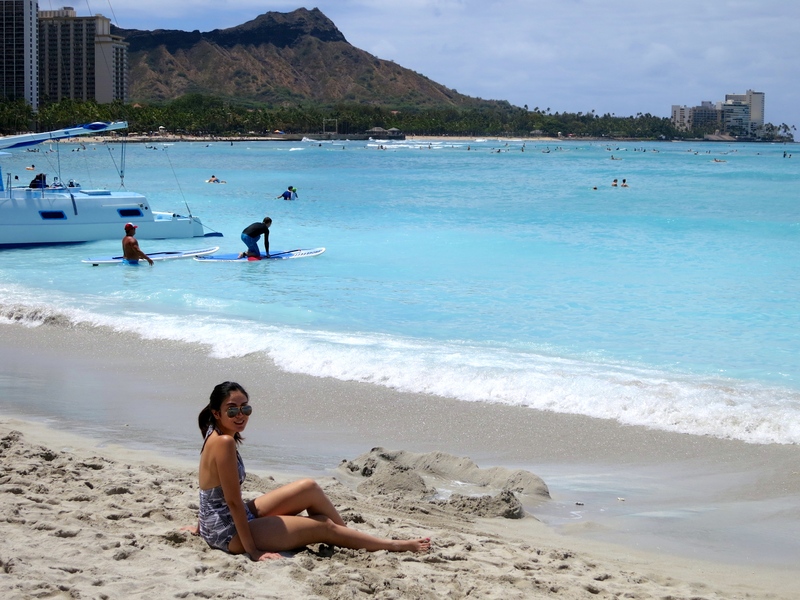 This reminded me of Boracay back home, the only difference was I had the Diamond Head on our left and the Pink Hotel at my back all to myself. That dark hand on the surfboard may look weird to you but that IS NOT my hand. He had to help me carry this heavy board but he had to hide. 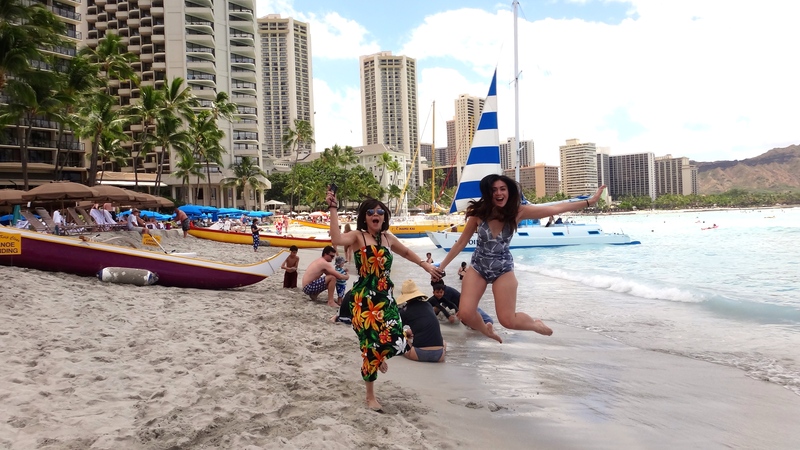 Our many attempts at a jump shot didn’t turn out the way we wanted them to. To the forever love of my life, thank you for everything! I love you and I will see you again soon, dad. But for now, all I have are blissful memories. *For links and websites to the different places, simply click on the highlighted words and it will take you right there. An!! This will be your next trip na 🙂 cant wait to see your eurotrip video! !